This baked egg recipe is a great breakfast for those mornings when you need something quick, nutritious, and filling. 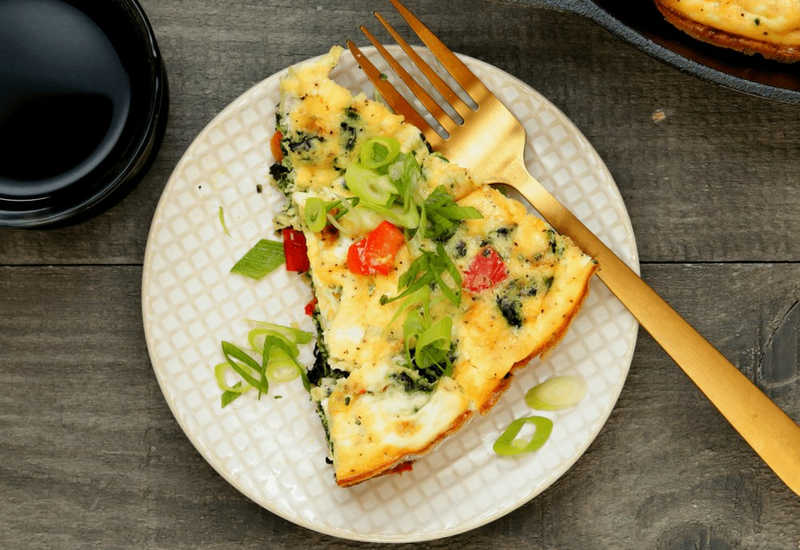 A mixture of sautéed bell pepper, green onion and spinach is cooked with a seasoned mixture of eggs, milk, and cheeses for a frittata-inspired casserole that's sure to hit the mark. Vary the vegetables depending on what you have in your pantry; the eggs would be equally delicious with diced, cooked sweet potato, shredded zucchini, chopped kale or even fresh or frozen corn kernels. Low in carbs and rich in protein, it's a meat-free breakfast that's sure to start your day off on the right foot. For more protein, stir in your favorite cooked chicken sausage to the vegetable mixture. To lower the cholesterol, use 8 egg whites and 2 large eggs instead. The casserole reheats well, and makes a delicious breakfast or lunch served warm or at room temperature. Per Serving: 191 calories; 14g fat; 4.9g carbohydrates; 12g protein; 272mg cholesterol; 742mg sodium. I tried this egg casserole and it was really good! It's really filled me up, but wasn't too heavy. The bell peppers, onion, and garlic gave it excellent flavor. This recipe i's great for a weekend brunch! This egg casserole is really good. I made this for a brunch I hosted at my house with a few friends, and they thought I had ordered it from a restaurant! They were shocked when I said I made it myself, and begged me for the recipe! So good! This one-pan casserole is such a life saver! It cooked perfectly in my medium-sized cast iron. I also used frozen chopped bell peppers, instead of a fresh pepper. Honestly could not tell the difference. Very easy and delicious. I loaded all of my leftover veggies (peppers, onions, and spinach included) in the egg casserole to cut down on food waste. I also added a little gorgonzola, so good! This was super easy, I am going to make it again soon! The only thing this casserole was missing that I decided to add was onion. Super tasty! I made it with bacon, crumbled it, and added it to the top. So yummy!